100% certified natural. Restores mature skin. Strengthens and firms. Intensive nourishing formula. Certified natural facial care.Evening Primrose Facial Care Restores mature skin This powerful range helps restore and firm while promoting radiance. Containing organic evening primrose oil it helps strengthen skin's structure, makes facial contours appear more defined and increases skin's resilience. Evening Primrose: Helps stimulate the natural defence system and restorative processes of mature skin. 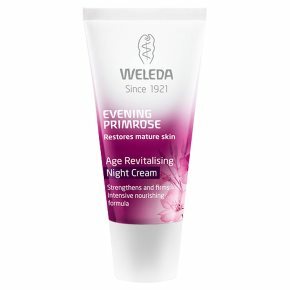 Age Revitalising Night Cream This nourishing formulation supports skin's own restorative processes helping to revitalise the skin. Structuring centella asiatica extract helps strengthen the skin and restores plumpness. Skin appears taut and full of vitality. Application:Apply every evening to your cleansed face, neck and décolletage. Massage in gently.